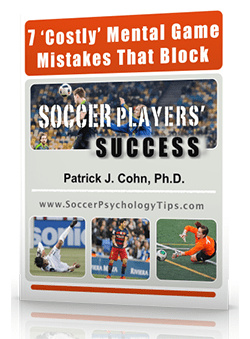 You are here: Home / Soccer Psychology Tips and Strategies / How Do You Respond To Mistakes? 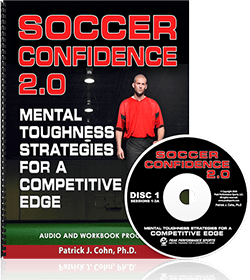 Self-talk plays a major role in how you motivate yourself as a soccer player. 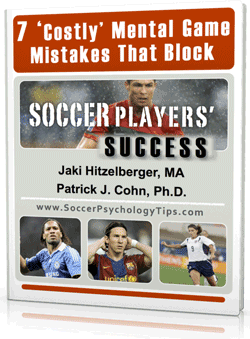 Negative self-talk can have a very damaging effect on your mental toughness in soccer. Self-talk can cause you to feel like a situation is worse than it really is. It can also negatively affect your self-esteem and confidence. As soon as you let negative thoughts creep in they will affect your performance. Blaming yourself for mistakes you’ve made will not eliminate them. In fact, it may cause you to feel worse about the situation. It is easy to think negatively after a bad pass or missed shot. Dwelling on your own imperfections can make the situation worse and can leave you feeling less confident than when you started. Being over-analytical can be detrimental to your performance and can work against you. Thinking too much about the consequences of messing up versus how to execute a pass will leave you feeling fearful. Focusing on the positives of your performances and trusting yourself can help you feel more confident in yourself. It can also help you handle mistakes in a more productive manner. Focus on the positive aspects of your performances. A positive attitude toward practice and competition is essential. Negative attitudes will only bring you down and your performance down too. You should always be able to find at least one positive aspect about your performance after a game. Work on ways to increase your confidence. Great soccer players exhibit confidence in everything they do. You can increase your confidence by learning new skills, overcoming a mental block, and achieving goals that you have set for yourself. One strategy is to focus on the present. It is easy to get caught up in thinking about mistakes you have made in the past. A bad pass in the opening minutes of a game can have a significant affect on the rest of the game, if you let it. Worrying about a mistake you’ve made will not correct it and will cause you to lose your focus for the remainder of the competition. Even though you have made a bad pass, the game is not over and you still have the chance to do well and make an impact. It takes a mentally tough player to be able to regain composure and focus after a bad touch or missed opportunity. How Can You Stay Confident After Mistakes?